Langley Aerodrome test flight. 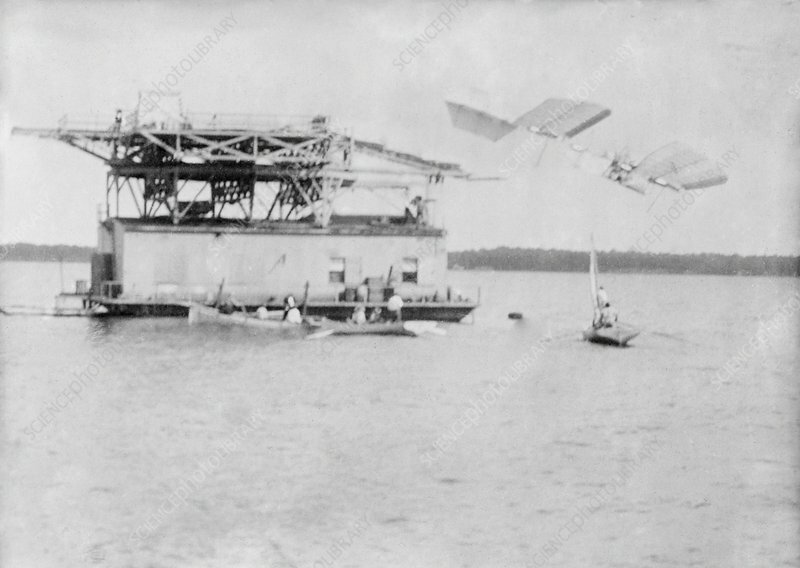 Full-scale Langley Aerodrome (upper right) after being launched by catapult from a houseboat in the Potomac River, near Quantico, Virginia, USA, on 7 October 1903. The aircraft fell into the water seconds later. A second test flight also failed. Both flights were piloted by Charles M. Manly (1876-1927). The design was by US astronomer and aviation pioneer Samuel Pierpont Langley (1834-1906). Langley built many aircraft models, some of which flew successfully, though the full-scale models failed. Following the failures, Langley died three years later, a broken man. Photograph from the Bain News Service.